Up at sparrow's this morning, relishing a glorious sunny dawn on Queensland's Wide Bay. My sister said, "The typewriters are being well looked after." Of course, when I set off on this odyssey from Canberra last Thursday, I had had to leave Charlie, my typewriter guard cat, behind. After all, there are still 700 odd typewriters back there, so someone had to keep an eye on them. When my sister said, "Come and see this", I was wondering who could be protecting the 17 portable typewriters now accumulated in the back of the station wagon. 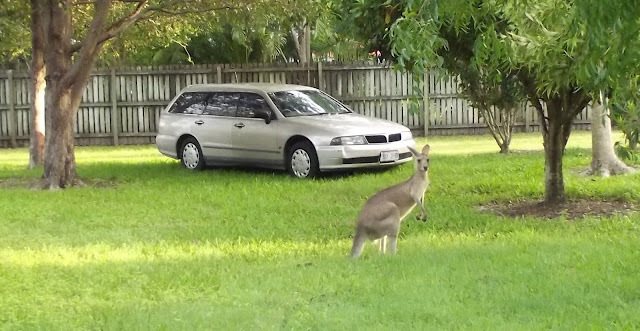 There, beside the car parked in my sister's back garden, was a large female kangaroo. The typewriters are all OK. 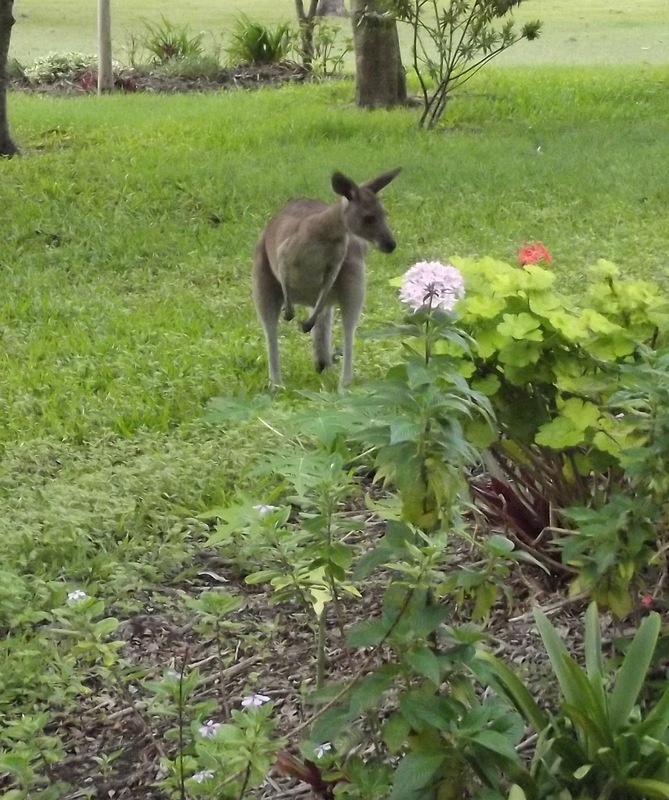 I'll just stop and smell the flowers afore I go. Day Five didn't produce any "new" typewriters - except the Urania Piccola, which finally fully emerged from its case, from its obscurity and anonymity, and from being a grubby eyesore with a badly tangled drawband, to a fully functioning typewriter - one with a very nice touch and typeface. AND A NAME! Thank you to all those who contributed overnight to helping me identify the Urania, or at least encouraged me in that quest: Florian, Ray, Rob, "M", Richard, Bill, Georg and Michael. Your comments were much appreciated. I was so glad I was able to get to Hervey Bay in time to work on the Urania, to get it cleaned up and working again, photograph it (albeit poorly) and post on it. Otherwise Day Five of the Odyssey would have been, at least typewriter-wise, completely fruitless. I made quite a few stops along the way from the Gold Coast to Hervey Bay yesterday, in the vain hope of jagging another typewriter. 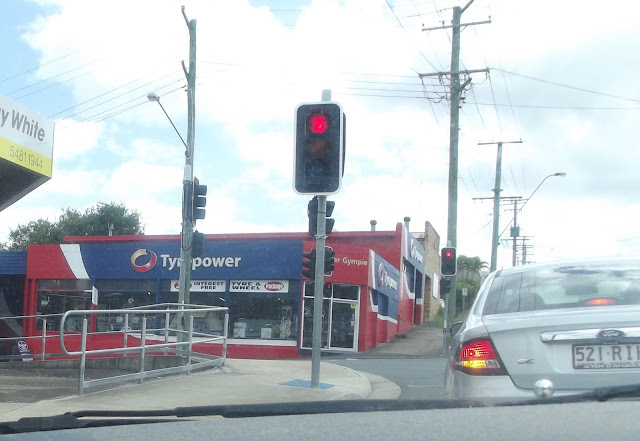 Taking my lead from Scott Kernaghan's post about finding a Hermes 3000 at a Lifeline store in Warwick, I made a bee-line for similar establishments in Gympie and Maryborough, but to no avail. Gympie's one antiques store was closed for the day, and two of the three in Maryborough were also closed for the day. The third in Maryborough bore no fruit. Feeling short-changed by Gympie, I sauntered back to my car. As I walked along the mall, an old lady stepped forward and handed me a card. I looked at it and read, "Whosoever shall call on the name of the Lord shall be saved." Ah, I thought, that's what I should be doing, calling for help from the Typewriter Gods. So I did that and confidently walked into what had appeared at an earlier glance to be an unpromising bric-a-brac shop. "No," said the even older lady behind the counter. "Not today, but you never know what tomorrow may bring." I didn't need to wait until tomorrow. I walked out and the next thing I knew a breathless young man was tapping me on the shoulder. 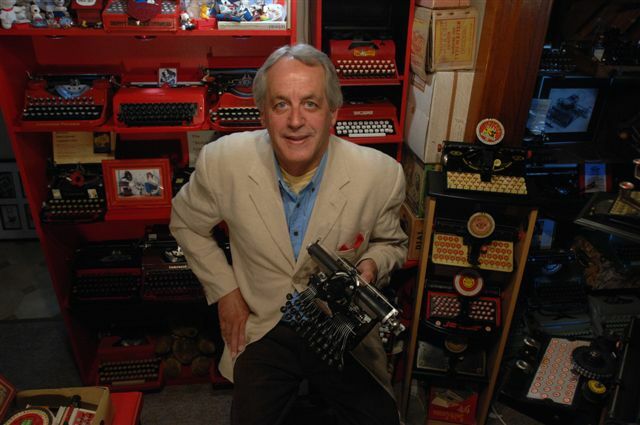 "Excuse me," he said, "but did I just hear you ask about a typewriter? I have one, a Remington, I'll sell it to you for $10." The Lord indeed works in mysterious ways, I thought. The Typewriter Gods even more mysteriously. But I explained I was just passing through town and since it would take this young half an hour to get to his house and back, there was no deal. To cap off this weird sequence of events, getting into my car I spotted an old football team-mate, one I hadn't seen in many years. 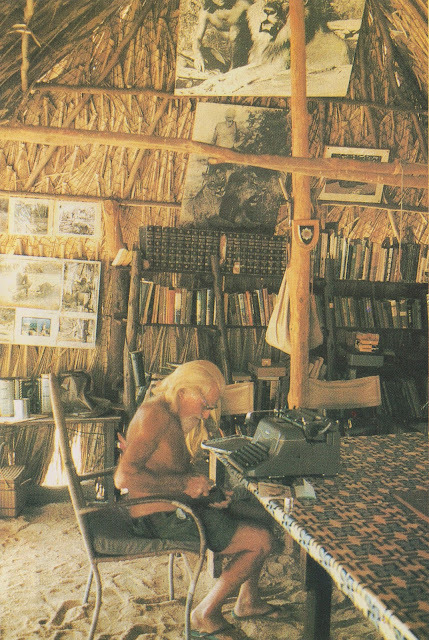 Mention of wildlife and typewriters reminds me that one thing I did find in Gympie, in a second-hand book store, was Adrian House's The Great Safari: The Lives of George and Joy Adamson. This contained coloured images of conservationist George and naturalist Joy (author of Born Free) typing. George is seen in a mess hut at Kora in Kenya, where "Snakes hunted in the roof, hornbills demanded to be fed at mealtimes and naked mole rats undermined the bookcase." 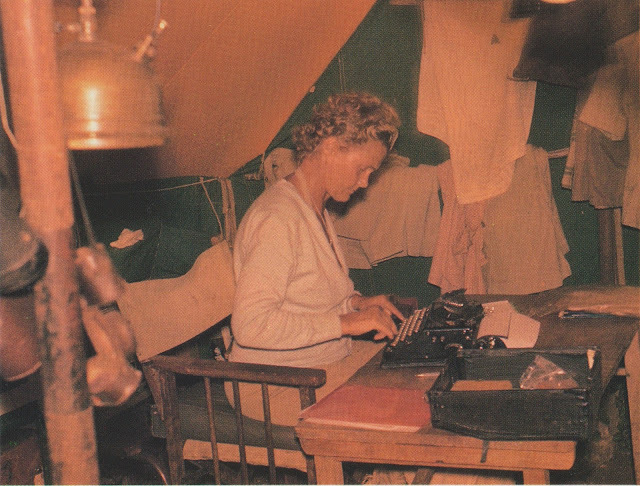 Joy is seen typing on a Remington Model 1 portable at Meru in Kenya. She "typed in her hut or, when the roof leaked, in her truck". 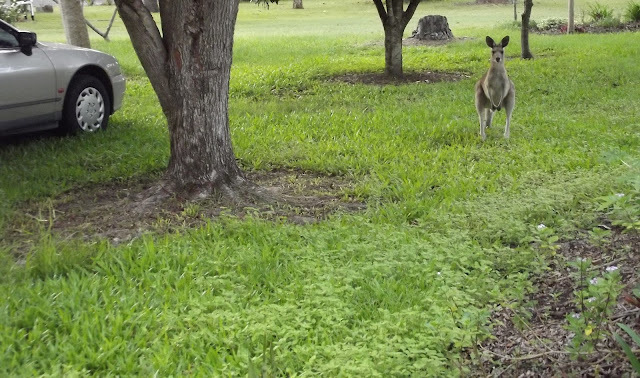 The Kangaroo was neat. Are they destructive. like eat shrubs and gardens? Nice to see the Piccolo working. 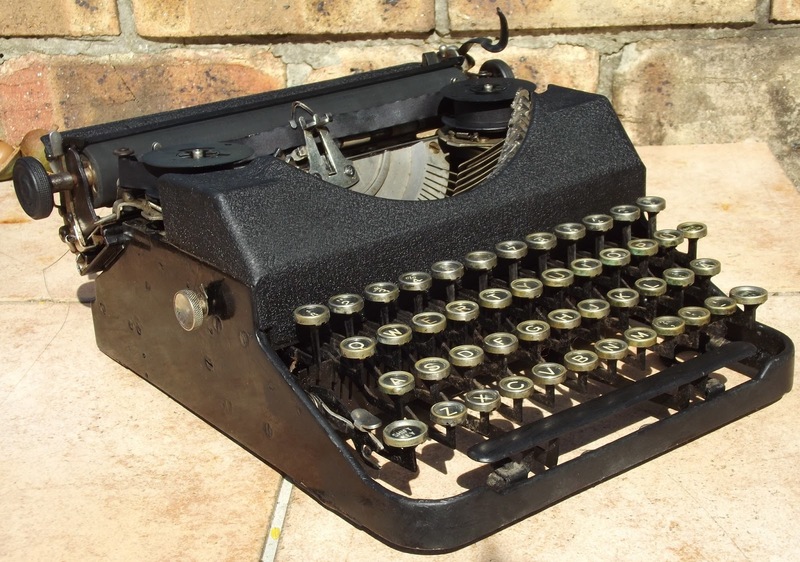 Too bad about no thrift shop typewriters. Rob, while you're in Gympie go and check out the Mining museum. They have quite a collection of machines there. And Bill, they aren't big eaters of flowers or leaves. They can strip a paddock of grass, and they often can pummel the ground into a slurry that wont grow much. I'm jealous of the close encounter with the kangaroo. Yesterday my daughter and I saw some small American counterparts: the first bunnies of spring. One hopped right over the other, twice! Great to read your type-in road trip! 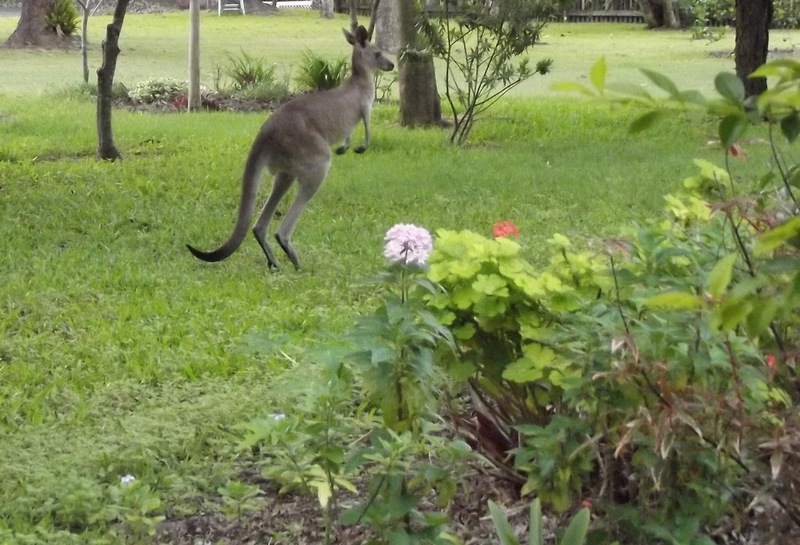 And the kangaroo... Only in Oz! Brisbane Type-In, Here I Come! Kolibri 'N': Can anyone help identify? One Week From Today! Australia's First Type-In!